Ahmad Abed, Noor Faradneh, and Nabil Dabdoub – three unit managers from the Office of the Vice President for Planning and Development– represented Birzeit University at the UniGov Project partner meeting, held on June 26, 27, 2018, at An-Najah National University in Nablus. 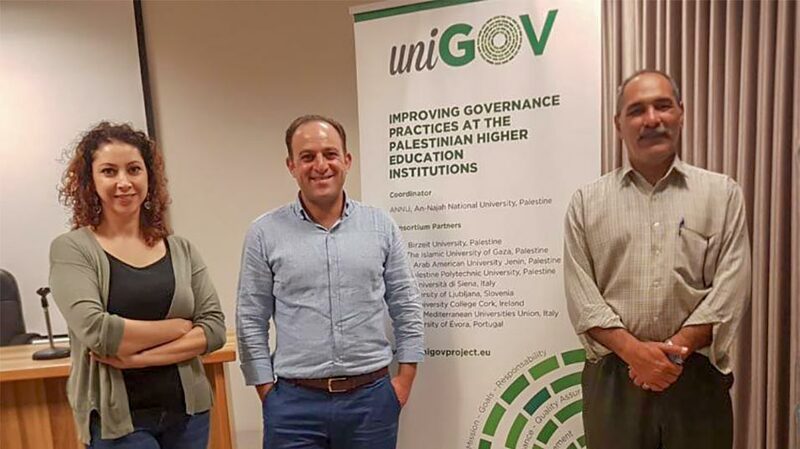 UniGov is a European Union-funded project that brings together Palestinian and European universities, as well as members of the Mediterranean Universities Union (UNIMED), to improve governing practices at Palestinian higher education institutions. Attendees discussed the project’s current outcomes and future steps, with Abed presenting the internal auditing report and quality control indexes the university will utilize for the remainder of the project. The team also joined UNIMED’s workshop, held during the two-day meeting, which opened channels of cooperation between the union’s universities and Palestinian and European colleges.